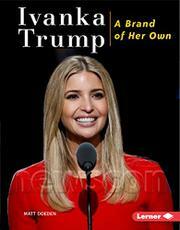 Opening and closing with strong hints that she may try to follow her father into the Oval Office too in a few years, Doeden retraces Trump’s course from childhood and the Marla Maples scandal through schooling, modeling, marriage, and starting a family along with various business enterprises. He salutes her intelligence and work ethic, suggests that she joined her father’s campaign more out of family loyalty than agreement with his stated platform, and claims that working in the White House “will give her a chance to help drive policies about which she is passionate, including childcare reform.” Readers hoping for insight into her character, values, or specifics of those “policies” will find no more than bland generalities here. Color photos show her looking glossy and glamorous while posing at podiums, with her children, her father, and (possibly former) “close friend” Chelsea Clinton.